Home / Behind Enemy Lines / Gene Berardelli / Russell Gallo / Swag / T-Shirt / TeeSpring / LIMITED TIME ONLY! BUY OUR T-SHIRT! LIMITED TIME ONLY! BUY OUR T-SHIRT! Click on the Photo to Order! If you're a Republican outnumbered by Democrats where you live, are a fan of snarky political humor, or a supporter of the 2015 National Award Winning Podcast hosted by Gene Berardelli & Russell Gallo - this is a must have for you! 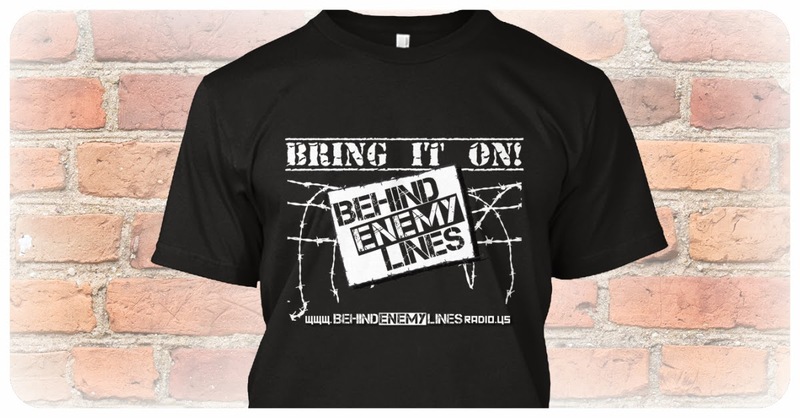 It's the FIRST EVER shirt for Behind Enemy Lines Radio! In years to come, it'll be a priceless collector's item, or a handy dish rag - either way, get it now! Available in men's and women's styles! And it's a mere $20! CLICK HERE TO PURCHASE!